Things don't always happen in the order they're supposed to, and that's alright. So the second of two new albums is ready first. It's available now at CD Baby and will soon be available at the usual digital sites. 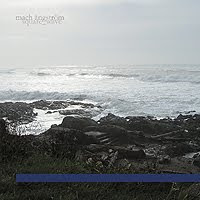 I'm excited about this one, as Mach Ångström is my first full-on drone release, and contrasts nicely with the other album-to-be. This thirty-plus minute piece is comprised of Serge analog modular synthesizer drones coaxed into sumptuous other-worldliness by spectral layers of ensemble generators, cured in spring reverb baths, and aged inappropriately by delays of the bucket-brigade and magnetic tape categories; augmented by dusty, ethereal guitar motifs. Recorded over two late nights in December 2008.